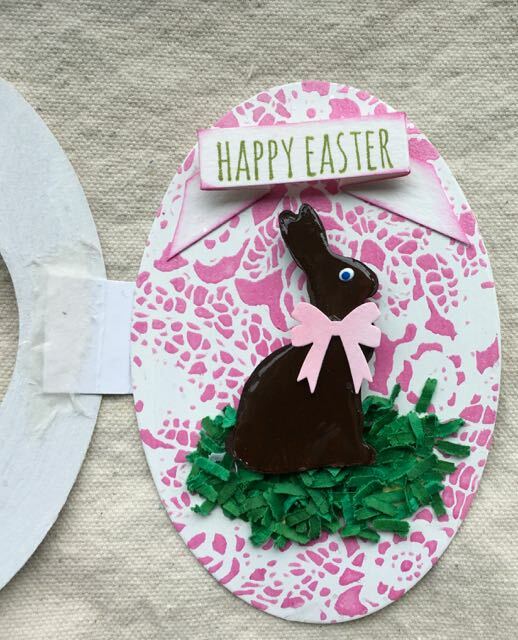 Here’s how to make Chocolate Bunny Cards with the Tim Holtz mini-bunny Mover and Shaper die. I made a bunch of these chocolate bunny Easter cards for my co-workers’ kids. I designed them to look like sugar eggs with a chocolate bunny inside. Here is the card. I am going to enter it in the Simon Says Stamp Wednesday Challenge “Spring Color Inspiration”. I have 2 of the 4 colors in the project for sure. And the other colors are certainly “Springy”. First I made the Easter bunny by cutting out in cardboard using a Tim Holtz mover and shaper bunny. Then I painted it a deep brown and coated it with a thick layer of Glossy Accents or the Tim Holtz Distress Paper Mosaic Glaze. The Mosaic Glaze was a little easier to use, but it is easier to find Glossy Accents. After the coating dried, I dabbed a blob of white Enamel Accents for the eye and then a smaller blob of blue in the center. The bunny really looks like chocolate to me. Doesn’t it look good enough to eat? I cut out the largest oval from the Sizzix framelits for the eggs. I used a smaller oval from a different set to make the opening in the front. I painted the egg with white gesso and then covered it with a coarse glitter. I made a bunch of little flowers from various punches and used Perfect Pearls in the center to make the stamens. The back piece was made by stamping a Tim Holtz floral background stamp design with Picked Raspberry ink and then covering it with clear embossing powder and embossing it. I think I used a stamp called Vines and Roses CMS298. The grass is made from a sheet of green cardstock that I ran through the shredder. I am tickled about that because I think it looks like Easter grass and I didn’t have to buy any. I stamped Happy Easter from the Tim Holtz Crazy Talk Stampers Anonymous CMS236 on a strip and folded it to look like a pop-up banner. The hinge between the eggs was a little tricky because it’s hard to hinge an oval object. 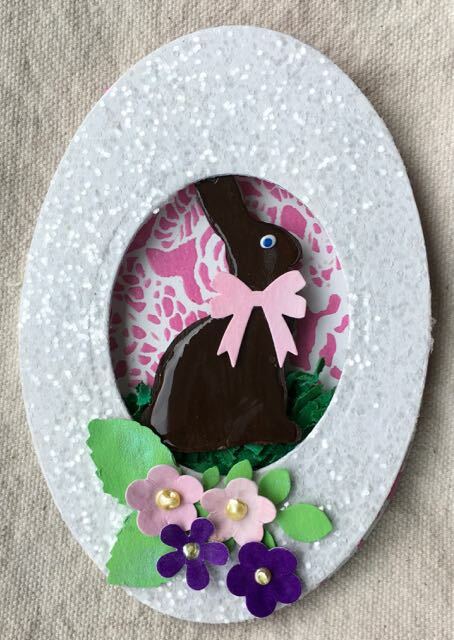 To make the hinge, I ended up gluing a piece of card stock to the back of the egg with the bunny on it and then taping it to the back of the see-through oval egg. That worked. Not a very elegant solution, but it worked. When I do an Easter card again, the main card will not be an oval shape. I would place it on a square or rectangular background to make it easier to make a hinge. Anyway, that was my Easter challenge this year. I may go back to making little houses for Easter or Spring next year since I do love to make little houses. Again, I am sharing this with the Simon Says Stamp Wednesday Challenge “Spring Color Inspiration”. Thank you for stopping by. Wow…..love this so much! So glad that you join the fun over Simon Says Stamp Wednesday “Spring Color Inspiration” Challenge! Awesome details and design! Super work!